Offbeats & Accents is another bargain‑priced drum sample pack from Original Music, costing £19.95. This gets you 802MB of content, comprising 64 drum loops in seven different formats and 72 studio hits taken from the same drum kit. 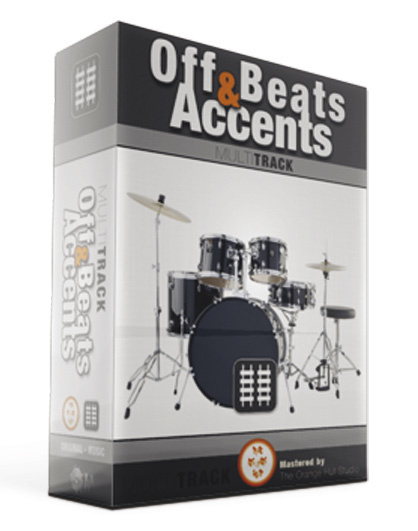 The included drum loops are presented in WAV, REX and Apple Loop formats, and also as slices in Sound Designer II and AIFF formats, with the accompanying MIDI files. A new and rather cool feature Original Music have added to this library is the inclusion of the multitrack files for each loop. These consist of kick, snare, undersnare, hi‑hat and overhead left and right tracks. This new content gives the user a huge amount of freedom to process each track independently — for example, applying reverb to the close‑miked snare. It also makes things like drum replacement or doubling and common side‑chaining treatments much easier than if you only had the loop. The pack is a pleasure to browse through, with everything really well organised and clearly labelled. The drum loops themselves are helpfully categorised by tempo into different folders ranging from 67.5 to 167 bpm. Many of the loops invoke classic breakbeats: for example, the Loops at 167bpm contain some variations strongly influenced by the 'Amen' break. It's great to be able to audition a selection of loops, find one that gets the creative juices flowing, and then import the multitrack of that loop into your sequencer to be processed in a way that complements the song you're working on. The pack's included 72 one‑shot drum hits give an ample selection of different hi‑hat strokes, as well as kick and snare hits recorded from soft to loud. This comes in handy when you want to add elements to a loop. Having spent a couple of hours trying out different loops and their accompanying multitracks, I think they are, on the whole, very usable. However, I do have a couple of niggles. The kick performance in some of the faster loops lacks clarity and punch, and the multitrack files themselves are recorded very flat and would benefit from a bit of studio sparkle and sheen. However, my biggest gripe is that Original Music have taken the odd decision of heavily gating the close‑miked kick, and sometimes the snare, and haven't done the job terribly well, with the spill from other drums often causing the gate to open and chatter unpleasantly. The gate noise is then made worse when you start to process the kick track with compression, bringing the side-effects of the gate up to unacceptable levels. This processing choice seems completely opposed to the largely flat‑sounding recording, and I would much rather have the ungated track as part of the multitrack, to process myself.